I remember watching The Jetsons as a kid. 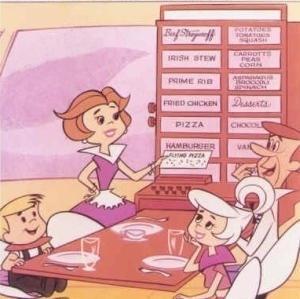 I also remember picking up the message about the direction of technology that the creators built into the Jetsons' lifestyle. Mostly, I remember thinking how unnecessary some of it was. Couldn't they walk? They needed conveyor belts for everything? Robots had to dress them? Of course, this is all part of the cliched fear of the mechanized age. It's how the Eloi became so frail. It's why we imagine aliens with huge heads and weak limbs. Someday, the writers imply, technology will do everything for us. Ridiculous, right? This weekend, I was with my sons at a neighborhood kid's birthday party. He had it at a place called "Funplex." (What ever happened to names like "Mister Licorice's Candy Drop Mountain? [long pause ] What?) It is a wonderland of technological fun -- go carts, video games. The works. There I was, sitting on a bench while the lads galavanted and threw four tokens into games that lasted thirty-five seconds. I checked my iPhone. As I did this, another dad noticed the gadget and, knowing that a fellow iPhone owner is more of a long lost brother than a coincidental consumer (Apple people can be just a tad spooky) he came over and struck up a conversation. He told me about a new "app" that is, essentially, a digitized "honey do" list for the 21st century. Apparently, this "app" uses GPS to remind you, as you drive home past the local grocery store, to stop and pick up milk. What was wrong with writing yourself a list? Or Post-its. They are both pretty efficient technology and neither of them is likely to make you run your car into a tree. And they don't track your position from space, as far as I know. Then, looking around the joint, I noticed the "strong man" machine. Time was, we macho chaps, standing tall among the shifting shadows of carnival flashes in the warm popcorn wind, would roll up our sleeves to afford our lady friends a glance at the biceps and triceps and swing a great wooden hammer at a pad with a little lever on it and a weight would slide up a vertical track. If you were strong enough, the weight hit a bell with a satisfying clank. If not, it stopped its assent at a panel labeled "girlie man," or something, and you had to redeem yourself by winning her the most obnoxiously large and mis-colored animal available at the baseball-throwing booth. Was there something fundamentally wrong with that? Well, the machine at the "Funplex" stood a mere four feet tall. You hit a pad and it registered a number up to 500,000. My question is, if you register a 389,432, are you a gorilla or a chickadee? At what point are you obligated to throw a four-seamer at the bottles and give the multicolored monstrocity a shot in order to save face? I think it is pretty typical of things these days that this machine has become virtual, at least in terms of its evaluation of studliness. But my real question is: what was wrong with the old technology? Can this machine be cheaper than a machine made of wood and steel? I doubt it. The thing stands, to me, as a symbol of Jetsonian technology. It is a "because we can" technology. 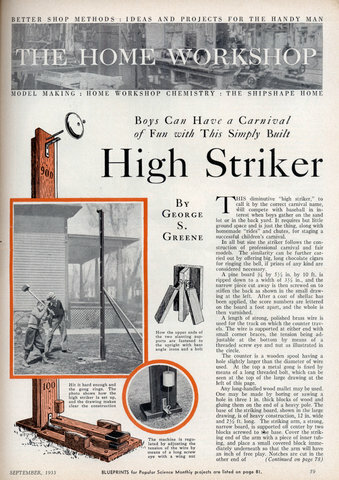 It certainly is not as tactile or as rewarding as swinging a real hammer and propelling a real weight at a real bell. If I could think of what makes this a more efficient, cheaper or more rewarding choice, I would say: "Okay. I get it." But I can't. I love technology. If I didn't have it, I couldn't be sending you this message; I couldn't have completed my CD (which is coming out soon -- shameless pitch). Without it, I couldn't get updates on my phone when the Phillies are playing and I'm unable to see the game. Without it, I couldn't play word games with my wife from twenty miles away. Without it, I wouldn't be in touch with so many old friends. Without it -- let's face it -- many of us would have been dead a long time ago (cancer, in my case). I only fear one thing: that we will forget the feel of dirt between our toes, pages between our fingers and sweat on our brows. Technology should free us to breathe in the important things in life. Did you know that the most complex synthesized tone ever created contains only a fraction of the complexity of the sound of a drum hit with a stick? I wonder how the ping of an electronic arcade game stacks up to the clank of a dirty old bell. What I do know is that no one's girlfriend is going to give him a big hug for hitting 432,319. And 345, 232 is not going to draw a cotton-candy-scented crowd. Well said sir. This goes right along with one of the complaints I hear about casinos now. The slot machines don't jingle out your prize anymore, and there's no arm to pull. (what do we call them now? no armed bandits? Bandits of the button pressing variety? I don't know, sounds kind of weak.) I remember my first experience with a strong man machine in 6th grade. I must have spent about 15 or 20 bucks just to win a giant inflatable bat (which i still have). So totally worth it. I just cant imagine the same fun from a bunch of numbers. Besides that, you totally don't look as manly to show off for women. Which is why that thing was invented in the first place wasn't it? "But my real question is: what was wrong with the old technology?" That's the question I asked myself the other day when I saw a TV commercial for a dispenser of pre-cut pieces of tape. Apparently turning that wee plastic wheel was a feat of strength beyond the might of mortal men. Papi -- I wonder if our fingers will eventually fall off, leaving us just one stylus-like appendage for flipping and poking screens; or if slot machines will eventually just say "good job" when you win. Jeff -- It's only a matter of a few generations . . . my grandkids' grandkids' grandkids will be surely wearing huge hats and tiny gloves, for sure.